Old house lovers in Portland, OR might be surprised to learn that many of the city’s most charming early 20th-century homes are actually built of concrete. Houses built of concrete block often masquerade as stone, while continuous-pour concrete houses are often mistaken for stucco. The 1909 Bramhall House in the Piedmont neighborhood is perhaps Portland’s most elaborate example of a concrete cast-stone house (above top and center). Smaller, simpler concrete houses were built too, such as the charming Southeast Portland home pictured directly above. A handsome cast-stone concrete house in Southeast Portland. Note the concrete columns and balustrade. The Swift Meat Packing Company in Kenton built many cast-stone concrete houses for their employees. Concrete houses were built for all income levels. The home at right is located in Portland’s West Hills. Maryhill, the Columbia Gorge home of visionary businessman Samuel Hill, was built of continuous-pour concrete in 1914. Concrete blockhouses are more common in Portland than the continuous-pour concrete house. It’s quite likely that the lovely stone house around the corner from you is actually made of concrete block — or “cast stone” as it was known in its day. Cast stone houses were built in all shapes and sizes, though the plain unadorned façades of the Foursquare style gave it a natural advantage over other more complicated shapes. Sometimes only the porch was made of cast stone, the house itself being of a more conventional wood-frame construction. Most concrete blocks were made on-site in special concrete block presses. This cut down the cost of moving heavy finished building materials over long distances. Sears’s mail-order cast stone houses contained everything to build the house — except the cast stone itself. However, the kit did include a concrete block machine where the homeowner could make his own cast stones from locally produced raw materials. The block machine could be fitted with several different face panels to better mimic the natural random texture of stone. Decorative columns and other architectural details were likewise made on site with special molds. Although all early 20th century neighborhoods in Portland contain at least some cast stone concrete houses, a distinctive concentration exists along Denver Avenue in the Kenton District of North Portland. Early records show many of these were built for employees of the nearby Swift Meat Packing Company. The largest, most impressive cast stone house on Denver Avenue was built in 1910 by a prominent leather manufacturer. Though not a Swift employee, we may surmise that he procured his hides from the nearby meat packing plant. Dr. Killingsworth also built his substantial cast stone house along this stretch of Denver Avenue. Nearly all of Kenton’s cast stone houses — and commercial buildings — were designed by Kenton architect Charles Speis. Continuous-pour concrete houses were constructed with large wooden molds called “forms.” These were often two (or more) stories high. Even the largest of these homes could be poured out in only about six hours. Add a few days for curing, and the basic home frame could be finished in less than a week. Even though the costs of materials and forms for the concrete house were greater than for conventional wood housing, the time saved in construction would make up for the extra expense. At least that was the theory. In reality, the costs associated with the forms proved quite expensive. Had a Leavitt Town-type developer existed back then, the forms could have easily been moved from lot-to-lot and efficiently re-used many times over. But concrete houses in Portland were produced independently in widely scattered sections of the city. Factory-line efficiencies never developed. These houses existed as prototypes of a technology that never really caught on with the public. Their intact survival to the present day, though, attests to their quality of construction. Without a doubt, these were (and still are) solid, high-quality homes. And they did succeed in their goal of providing a sanitary, fire-resistant, rot and insect proof dwelling for their inhabitants. There was much to recommend these houses. But it nonetheless must have been a hard sell to promote concrete houses in the center of lumber-land where we live. Considerably more concrete houses were built in the less treed Los Angeles and San Diego areas. More research needs to be done on Portland’s continuous pour concrete houses. What a wonderful master’s degree thesis topic this would make for someone! On the East Coast, the great inventor Thomas Edison was a strong proponent of concrete houses. He fervently felt that the continuous pour concrete house was the wave of the future. He ended up building more than 100 concrete houses in the Foursquare style, their simple unadorned façades once again proving especially well suited to concrete construction. He even furnished some of his houses with concrete furniture, and there’s at least one report of a concrete piano. Edison’s concrete houses were more doctrinaire than those built in Portland: even his interior walls and floors were made of concrete. (Portland’s having more conventional interior framing.) This may have contributed to the undoing of the houses’ popularity. Homeowners found it difficult to remodel interiors or even update plumbing, electrical, and heating systems. Even little things like hanging a picture on the wall proved difficult if not impossible. 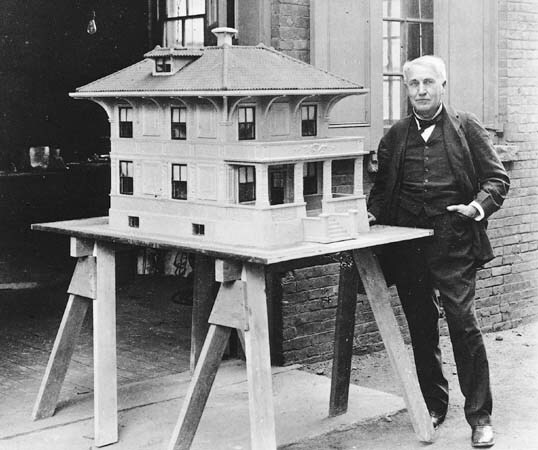 The all-concrete house will probably not go down in history as one of Edison’s greatest inventions. Still, 100 of them did get built, and many, if not most, are still standing. He also succeeded in starting to get a handle on the mass production methods necessary to hold costs down. Several years ago, Oregon Public Broadcasting (OPB) investigated Edison’s concrete houses in a segment of their OPB-produced The History Detectives. Concrete blockhouses had one additional flourish in Portland (and the nation) in the Post World War II period. In the war’s immediate aftermath, many conventional home building materials were in short supply. Many ranch houses of the era were therefore built with easily obtained concrete blocks. Unlike the early 20th century concrete blockhouses, these modern homes made little or no effort to conceal their origins as utilitarian concrete. This was in keeping with the Modern Era’s emphasis on “honesty” in house architectural design. Many houses were being built at the time, for instance, with open beam ceilings where the construction members of the house were clearly visible. Leaving concrete block as concrete block easily fit in with this design philosophy. As post-war scarcity gradually turned into post-war prosperity, exposed concrete block construction fell out of favor with most of the home buying public. Many houses were still built with concrete blocks but more usually with a wall of decorative brick veneer covering them up. Concrete construction has been around since ancient times but only in the very late 19th century did it become practical to build everyday structures with this material. Portland’s early 20th-century concrete houses were therefore built on the cutting edge of this new American concrete renaissance. The latter half of the 20th century saw concrete used mostly for high-rise construction in American cities, in large institutional and commercial buildings, and of course, in the thousands of miles of the interstate highways and local road systems. Who knows what future changes in technology, social factors, and economics might once again make concrete a viable form of house construction? Previously, the Architectural Heritage Center has presented a program on Portland’s concrete houses. Visit www.VisitAHC.org for more information on upcoming programs. 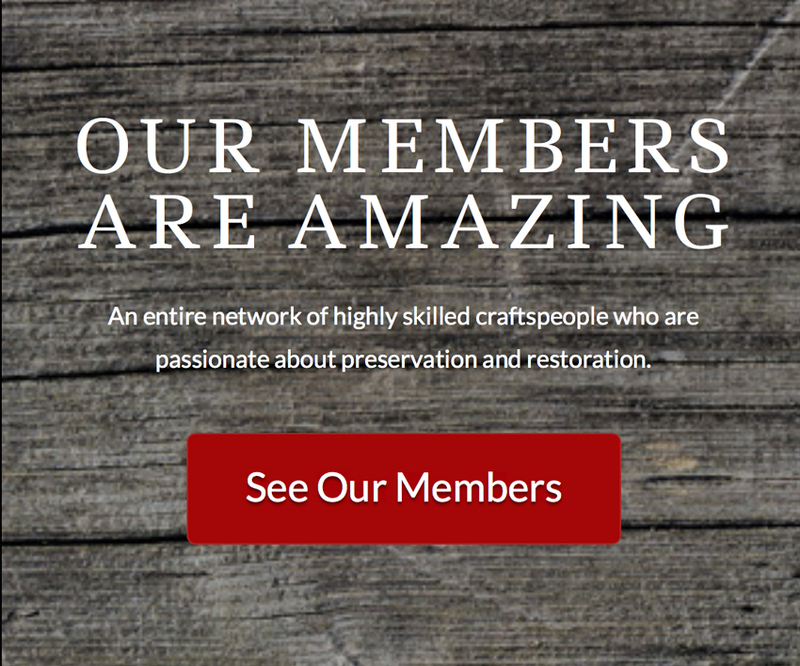 Jack Bookwalter is a freelance writer and architectural historian living in Portland, OR.